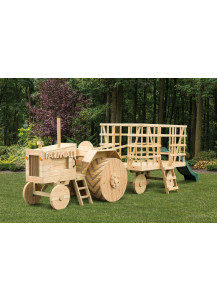 The Tractor & Wagon play set includes a tractor that measures 5' x 9' and a wagon that measures 5' x 8' and also includes an 8' slide and one steering wheel. Available unfinished or with water sealer applied to the entire play set. 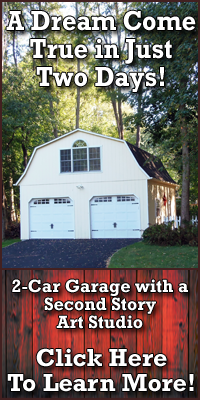 Available fully assembled or in kit form. Stop by our Red Hook, NY location to see our display model swing sets and look at choices for accessories and other options. 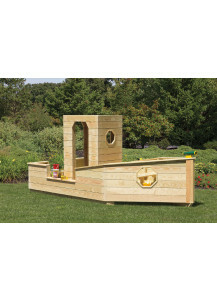 The Sandbox Boat play set measures 6' x 13' x 6' high and includes one steering wheel. Available unfinished or with water sealer applied to the entire play set. Available fully assembled or in kit form. 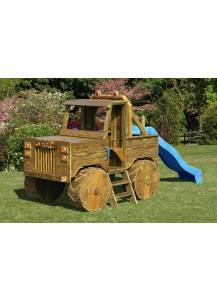 The Jeep play set measures 5' x 8' x 6' high and includes an 8' slide and two steering wheels. Available unfinished or with water sealer applied to the entire play set. Available fully assembled or in kit form. 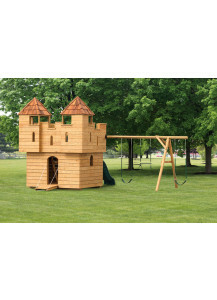 The Small Castle play set measures 7' x 8' x 7' 9" high and includes and A-Frame swing set with two swings, 10' slide, drawbridge, inside ladder & bench and fireman's pole. Available unfinished or with water sealer applied to the entire play set. 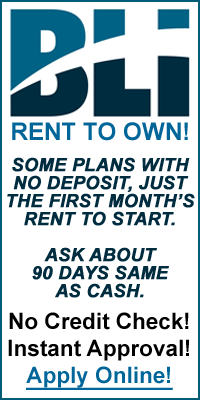 Available fully assembled or in kit form. 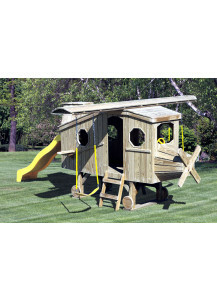 The Airplane play set measures 4' x 11' x 7'4" high and includes an 8' slide, two swings and one steering wheel. Available unfinished or with water sealer applied to the entire play set. Available fully assembled or in kit form. 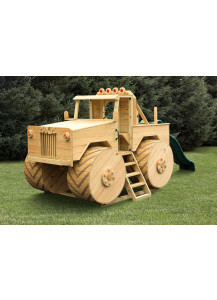 The Monster Truck play set measures 8' x 12' x 8' high and includes a 10' slide, one steering wheel, stick shift and gas pedal. Available unfinished or with water sealer applied to the entire play set. Available fully assembled or in kit form. 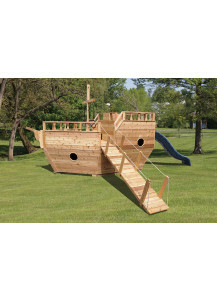 The Small Boat play set measures 8' x 14' x 7' 6" high with a 4" x 4" x 10' mast and includes a 10' slide, ladder, ramp, ship's wheel, fireman's pole and two trapeze bars. Available unfinished or with water sealer applied to the entire play set. Available fully assembled or in kit form. 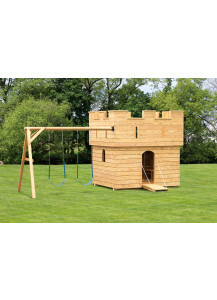 The Medium Castle play set measures 8' x 9' x 9' 2" high and includes and A-Frame swing set with two swings, 10' slide, drawbridge, inside ladder & bench and fireman's pole. Available unfinished or with water sealer applied to the entire play set. Available fully assembled or in kit form. 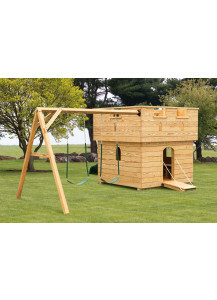 The Large Castle play set measures 8' x 12' x 9' 2" high and includes and A-Frame swing set with two swings, 10' slide, drawbridge, inside ladder & bench and fireman's pole. Available unfinished or with water sealer applied to the entire play set. Available fully assembled or in kit form. 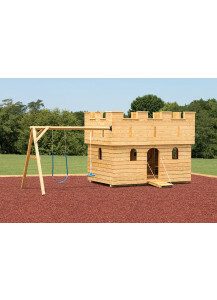 The Medium Charlotte Castle play set measures 8' x 10' x 13' high and includes and A-Frame swing set with two swings, 10' slide, drawbridge, inside ladder & bench and fireman's pole. Available unfinished or with water sealer applied to the entire play set. Available fully assembled or in kit form.